Congress chief Rahul Gandhi has written to Mamata Banerjee extending support for her United India rally. The rally in Kolkata tomorrow is tipped to be a major gathering of anti-BJP parties ahead of the national elections this year. 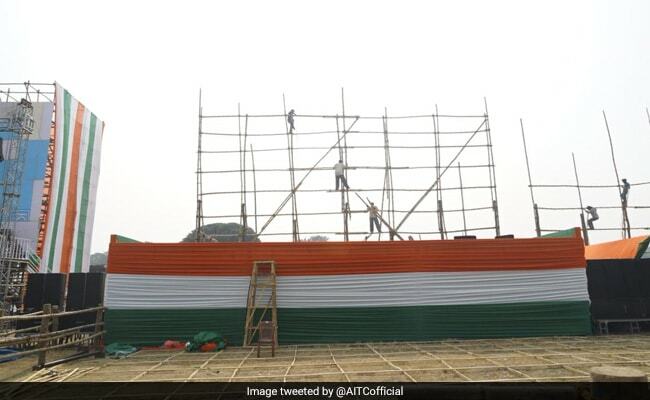 West Bengal Chief Minister Mamata Banerjee oversees preparations at the venue. 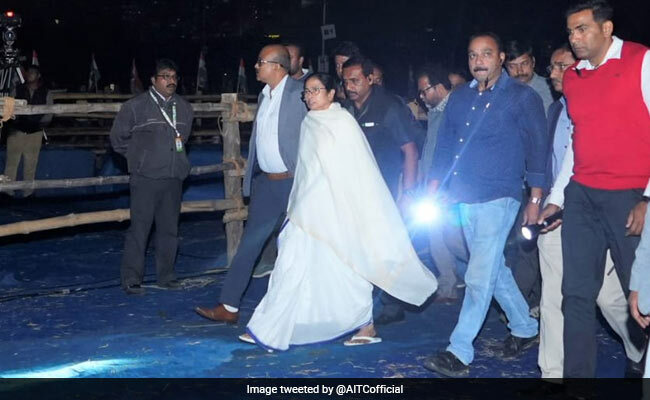 The stage is set for West Bengal Chief Minister Mamata Banerjee's "United India rally" in Kolkata on Saturday, tipped to be a major gathering of anti-BJP parties ahead of the national election due by May. Lakhs of Trinamool Congress activists and supporters from across West Bengal thronged Kolkata today. Top leaders from regional parties, including former Prime Minister HD Deve Gowda, Samajwadi Party leader Akhilesh Yadav, former Chief Minister of Arunachal Pradesh Gegong Apang and Nationalist Congress Party leader Sharad Pawar among others, also reached Kolkata today. Meanwhile, Congress chief Rahul Gandhi wrote to Mamata Banerjee today in support of her rally. "I extend my support to Mamata Di on this show of unity and hope that we send a powerful message of a united India together," Rahul Gandhi wrote. The Congress president and his mother Sonia Gandhi are not attending Mamata Banerjee's event; the Congress will be represented by Mallikarjun Kharge and Abhishek Manu Singhvi. Senior BJP leader Shatrugan Sinha arrives in Kolkata to attend the rally tomorrow. Farooq Abdullah, HD Deve Gowda, Farooq Abdullah, HD Kumaraswamy have also reached Kolkata. Other leaders who arrived in the city today include: JMM Leader Hemant Soren, Congress' Abhishek Manu Singhvi, Rashtriya Lok Dal leader Ajit Singh, Loktantrik Janata Dal Sharad Yadav, social activist Hardik Patel, BSP's Satish Chandra Misra and Andhra Pradesh Chief Minister N Chandrababu Naidu. Dravida Munnetra Kazhagam's MK Stalin reaches Kolkata. Arun Shourie, former Union Minister, arrives in Kolkata to attend the rally at Brigade Parade Grounds tomorrow. Samajwadi Party president Akhilesh Yadav today said the nation is waiting for a new prime minister and a message of change would go out loud and clear from the the mega opposition rally of Mamata Banerjee's Trinamool Congress on Saturday. "This is an anti-BJP rally. So many opposition parties are taking part in it and we are also part of it. It has nothing to do with Uttar Pradesh politics as that is a completely different turf," Samajwadi Party vice-president Kiranmoy Nanda said. The Congress also said the mega opposition rally should not be confused with political equations in Uttar Pradesh. The Trinamool Congress party said "regional political compulsions" should not be mixed with the bigger political cause attached with the proposed rally. The Biju Janata Dal (BJD) is unlikely to participate in the "united opposition rally" in Kolkata in pursuance of its policy of keeping equal distance from both the BJP and the Congress, a BJD leader said today. Odisha Chief Minister and BJD chief Naveen Patnaik had earlier made it clear that the BJD will not be a part of the Mahagathbandhan, a national level alliance against the BJP-led government at the Centre. Other leaders expected to be present tomorrow include Delhi Chief Minister Arvind Kejriwal, Karnataka Chief Minister HD Kumaraswamy and Andhra Pradesh Chief Minister N Chandrababu Naidu. Rashtriya Janata Dal (RJD) leader Tejashwi Yadav, Dravida Munnetra Kazhagam's MK Stalin and dissident BJP MP Shatrughan Sinha are also among those billed to attend the mega rally. Former union ministers Yashwant Sinha and Arun Shourie, Patidar leader Hardik Patel, Dalit leader Jignesh Mevani and Jharkhand Vikas Morcha's Babulal Marandi will also be present on the stage alongside TMC supremo Mamata Banerjee. Samajwadi Party leader Akhilesh Yadav arrives in Kolkata. As part of arrangements, 50 temporary camps have been set up in Salt Lake's Central Park. Around 2,000 volunteers have been deployed to take care of the supporters while at least 12 CCTV cameras have been installed to ensure their security. "The people staying here will be provided three course meals on Friday. We have also arranged for blankets. The entire accommodation is under CCTV surveillance and there are medical camps and sufficient fire fighting arrangements. We have also made a separate area for the members of minority community to read Namaz (prayer)," state Fire Minister and local legislator Sujit Bose said. According to the Trinamool Congress leadership, nearly four to five lakh people have arrived in the city to hear and watch the opposition gain steam at the rally. Apart from bringing thousands of supporters from their respective constituencies, the party leaders have also made special arrangements for their food, lodging, security and other necessary amenities in different parts of the city. "Close to 70,000 activists have arrived at Sealdah station from different districts of north Bengal since morning. People have come onboard the Katihar Express, Uttar Banga Express, Padatik Express and Kanchan Kanya Express so far. More people will arrive on the Kanchanjunga Express in the evening. Another 7,000 people have arrived at the Kolkata Rail Station (Chitpur)," said state Food Minister Jyotipriyo Mullick, who was supervising the arrival of the party activists at the Sealdah station. Top leaders including former Prime Minister HD Deve Gowda, Samajwadi Party leader Akhilesh Yadav, former Chief Minister of Arunachal Pradesh Gegong Apang, Nationalist Congress Party leader Sharad Pawar, Zoram Nationalist Party leader Pu Lalduhawma and JMM leader Hemant Soren have reached Kolkata to attend the United India rally tomorrow.